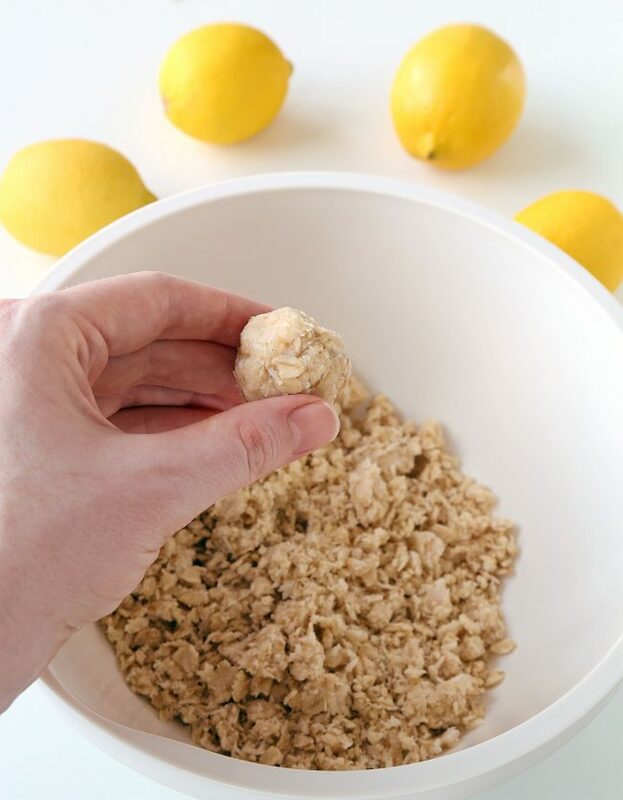 These lemon energy bites are easy to put together, full of lemon taste and vegan and gluten-free. This post has been sponsored by Wholesome. All thoughts and opinions are my own. I hope everyone enjoyed the holidays! 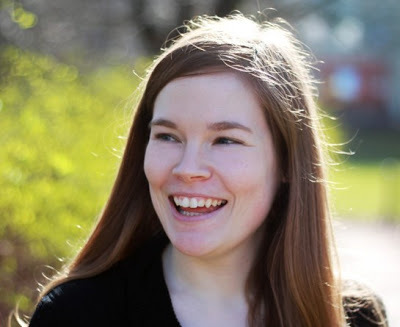 I had these great plans to post a ton of cookie recipes in December but after baby Björn was born so late and my parents came for a visit, I couldn’t manage to get the recipes posted. None of the recipes are overly Christmas-y so those recipes will be coming soon! After the holidays, I’m exhausted from all the baking. And overly indulgent foods. 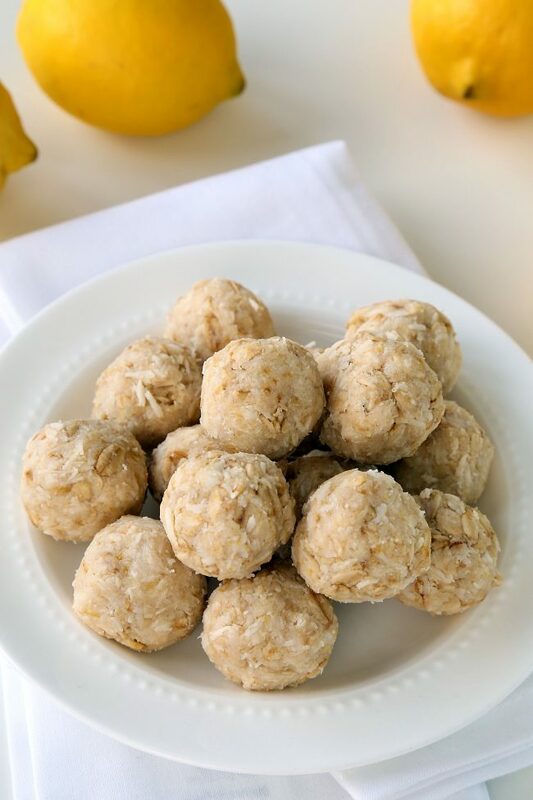 So today we have some super easy lemon energy bites! This recipe calls for good for you ingredients like coconut butter, cashew butter, oats, coconut and to sweeten them, I used Wholesome Organic Stevia. You can find Wholesome Organic Stevia in the baking aisle at your local grocery store and use this handy store locator to find a retailer near you. You can also get a coupon for $1. 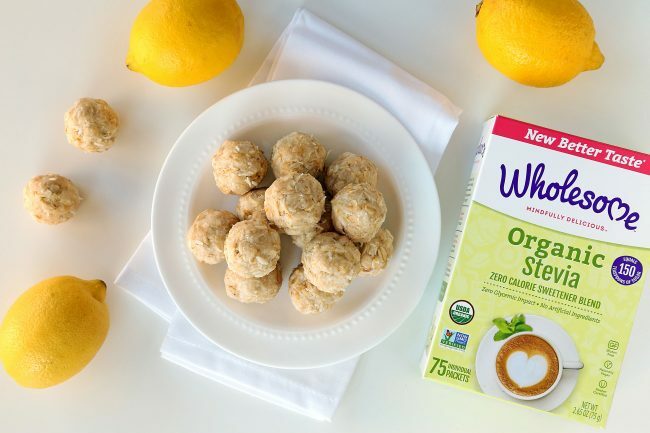 Wholesome Organic Stevia brings all the sugar-like sweetness, without any harmful chemicals and USDA Organic – made from organic stevia, erythritol from organic corn, and natural flavor. It’s also non-GMO Project Verified and has zero calories and no glycemic impact, which is great for people watching their calories, sugar intake or blood sugar levels. It’s gluten-free, vegan and kosher. I used 4 packets in this recipe. Each packet is equivalent to 2 teaspoons of sugar and the individual packets are super convenient to bring on the go. Wholesome also has jars of Stevia should that work better for you. Just don’t forget to take advantage of this coupon offer to really “sweeten” the grocery list. If you need these energy bites to be gluten-free, make sure to use gluten-free oats. These energy bites are also naturally vegan and dairy-free! If lemon isn’t your thing, I’m thinking that lime may be a good alternative to lemon. But I haven’t tried it so I can’t say for sure! For the coconut butter, there’s unfortunately not a good substitute. If you’re wondering where to get it – you can make homemade coconut butter with just shredded coconut, a food processor or a high-speed food processor. If you use a food processor, it can take quite a while. Maybe 10 minutes? It really depends on your processor. If you use a high-speed blender (it doesn’t work in a regular blender), then it takes more like 2 minutes! Cashew butter can also be made in the food processor or high-speed processor and goes along with the lemon taste really well. I loved the combination in this vegan paleo lemon fudge and definitely recommend using cashew butter rather than peanut or almond butter. I’m pretty sure they’d work out texture-wise but it sounds like a weird combination! Same with sunflower seed butter. I think cashew butter just goes better with lemon. If you’re a lemon lover like me, be sure to try out my paleo lemon cookies or lemon pound cake. 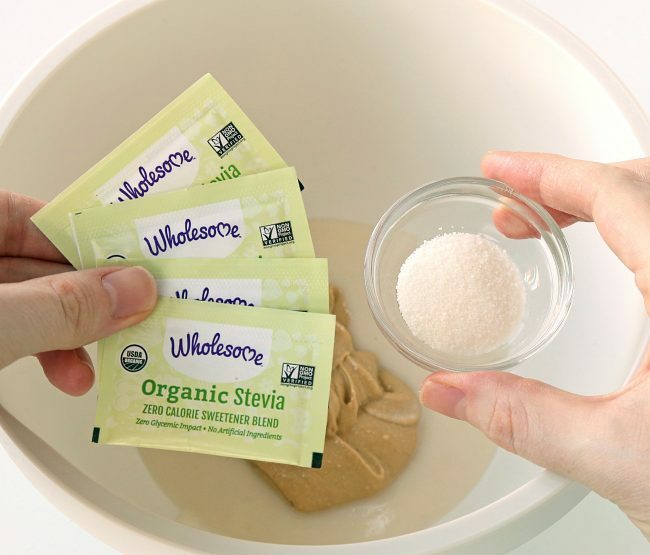 And for more great recipes using stevia, check out Wholesome’s recipe section. Don’t forget to use the store locator to track down where to pick up your Wholesome products! Hope you all enjoy the energy bites! In a medium bowl, mix together the coconut butter, stevia, lemon zest and lemon juice. Keep the coconut balls covered and store in the refrigerator for up to one week. They're also fine at room temperature for up to 3 days. 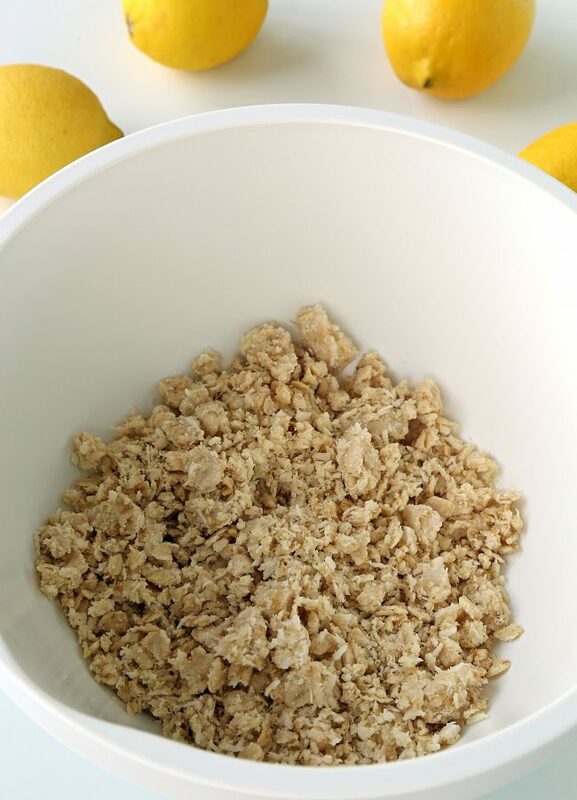 18 comments on “Lemon Energy Bites Recipe” — Add one! What can I use instead of cashew butter. Can’t eat cashew nuts. I don’t think any other nut butters really go well with lemon. Sorry about that! I prefer to put honey in as a sweetener to this recipe. How much should I put in to to replace the stevia or dates for sweetness. I actually recommend you use this lemon energy bites recipe instead. :) Just use honey in place of the maple! What else could be used don’t like coconut? Hmm. 1/2 cup is a lot to sub of something. I can’t think of something else that’s slightly sweet that’d be a good sub. Sorry about that! Do you know how much sugar is in each bite/serving? Thanks! These energy bites sound so refreshing and yummy! I need to make a batch soon! i am so excited to make these! love lemon everything! What a great snack option! I love them! These look incredible! I could have lemon ANY time of the year! The perfect post-workout or mid-afternoon snack. 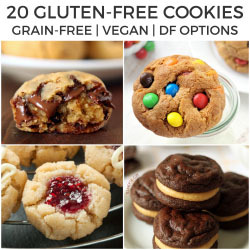 I love all the ingredients in these bites. And i love that you used stevia. Oooh, these sound so yummy, I can almost taste that fresh lemon juice and zest! YUM! These energy bites look delicious and so easy to make!